I just started having giant angled planes appear in world in Kama City. I thought it was a viewer problem, but it's happening on both a Linux machine running Firestorm and a Windows 7 machine running the LL viewer. Is this a bug, or some kind of griefing? In Rhodenwald and other places in Kama City. Thanks. Someone is playing J-Pop, too. I filed an AR against the griff objects. Yes, got an owner, filed an abuse report. Kama City is unusable until this is fixed. It must be kama. You upset anyone lately? 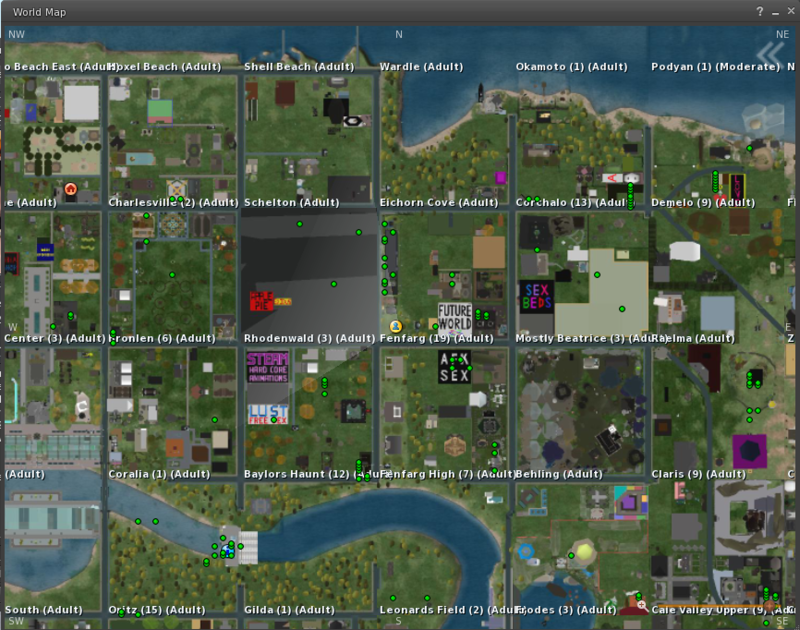 This is affecting a large area in Zindra, maybe 10 sims, all the way to Horizons. I'm about 2 sims away from the center of it. For most of the big flat planes, clicking on returns says "no object selected". But in Rhodenwald, it's selectable. Owner: "Kiss my ...." (full name in abuse report.) Payment info used. Land impact: 1 Display weight: 404. Contents: 3 anime dance animations, "Homing Script", music, and a texture animation. The griefing is still going on as of about 5 minutes ago. 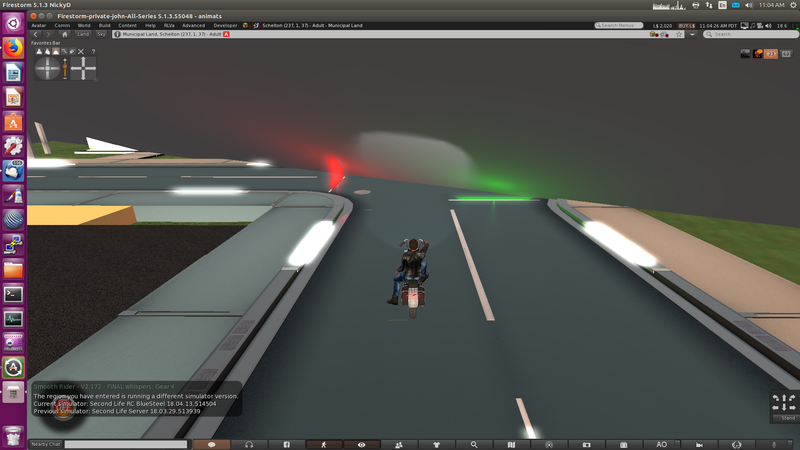 I went over to Heterocera for bike testing, and when I came back, Kama City was still having problems. Areas within about 500m of Rhodenwald are affected. I saw a Linden in world a hour ago, and I sent them the object UUID and some other info, but the problem didn't get fixed. Two days ago there was a problem in the same area which was causing strange region crossing failures. Not just a half-unsit; the bike disappeared and was never seen again, not even in Lost+Found. The regions were restarted and that went away. Today, I hit a temporary "region full" error on a region that's normally nowhere near full. The "region disappears across a diagonal" problem keeps coming back. And Vallone still has a huge spike in lag every 10 seconds. As a property owner in Zindra, I'm not happy about all this. Pictures really don't do this mess justice. Infinite planes at all angles everywhere flickering madly. I'm amazed this is still going on. Daww, exploding a Payment Linked account like that. I wonder if it's a phish takeover, a person who unpacked something promising free money, or someone who just broke up with their girlfriend and has become unhinged. It's still going on, over 8 hours later. Where's the abuse team when you need them? That parcel is set to infinite auto-return time. Object entry, but not building, is allowed. The adjacent parcel allows building but has a 2 minute auto return. So someone can rez a nuisance on the parcel that allows building and move it to the no-autoreturn parcel. I can't find the object center, but it's playing loud J-Pop music and that's coming from there or very near. Where's the abuse team when you need them? Hmm, It's drinks night down the local, and Governance have had a real full day reading tickets about so-and-so's scheming husband who ran off with that trollop from the next sim over - or how so-and-so was scammed of 50 lindens when she ordered those textures from the marketplace. I'll guess they are now three bottles of Scotch into a party, throwing darts at AR profile photos. Yep, that sounds 100% like a Governance party! Caramelldansen and shots of schnapps. It's not so bad. We finished and tested the product version of the region crossing bike,, and it's now for sale at the 2RAW EXTREME racetrack/store, on a private sim far from the trouble sport. I don't have to do anything at my workshop in Kama City for a while. So I went out in RL, went to the ocean and had a fish dinner at a place on the coast south of San Francisco. SineSpace is so empty it makes Metropolis Metaversium look busy. There are about 10 people in world right now. It's disconnected sims about 1-2km on a side, like Sansar. There are about 30 of them, and none of them have much in them. I'm in a steampunk city. It's completely static. Nothing does anything. Can't even open doors. The buildings I can enter are empty rooms. Nothing to click on unless someone sets up a button. No sitting. No objects that do much. Walking up stairs works; the feet go on the steps properly. Level of detail handling is sometimes really good. You can see out to the horizon in the desert and you don't see the changes in level of detail unless you look hard. But in crowded areas, they seem to overuse fog, like Sansar does. Each area has its own visual style. Too many of them look like My First Indy Game. Overall, it feels like a collection of unrelated games. They share an inventory, but that's about it. 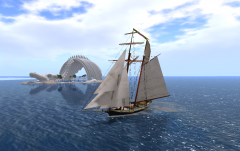 It's not a serious competitor to Second Life, and it doesn't seem likely to become one. Still there 15 hrs later. Still there 22 hours later. Rhodenwald is blacked out. This shows in the world map above. Anything within draw distance of Rhodenwald is affected. The giant planes extend far beyond Rhodenwald, but you have to get into draw distance at least once before they become visible. I'm over in Vallone, and if I avoid going east of Vallone into Clarksville, I can still use my property. The 9 sims around Rhodenwald are essentially down right now. 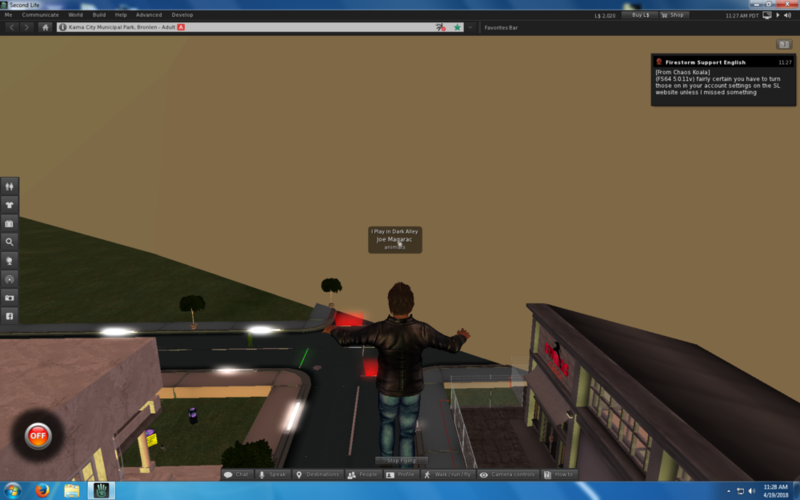 Higher level skyboxes beyond draw distance to the ground are unaffected. Thanks for filing that AR. Our Governance Team is on the case now as I type. Things should look a lot more clear there very soon. Thanks again (to all who have filed those ARs)!